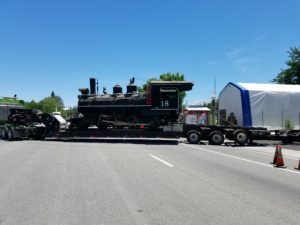 The Slim Princess locomotive was on the road, and the sight of a full-size steam locomotive rolling down US 395 drew quite a crowd. 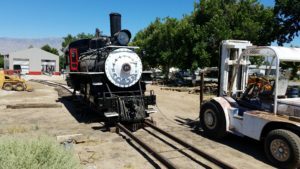 The fully refurbished narrow-gauge locomotive was loaded on a semi-truck trailer on June 9 and hauled from its longtime perch in Dehy Park in Independence to its new home in the recently constructed Larry Peckham Engine House at the Eastern California Museum. 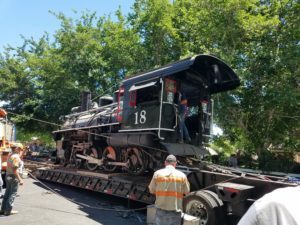 Residents of Independence and surprised visitors and passersby stopped to watch the all-volunteer crew from the Carson and Colorado Railway lay down temporary track that was used t o roll the 22-ton locomotive to the trailer. The large semi-tow truck from Miller Towing in Lone Pine winched the engine onto the trailer. Once secured, the rig rolled down US 395 and then up Onion Valley Road and deposited the Slim Princess at its new engine house. In a way, the very public move of Engine #18 represented history repeating itself. In 1955, Southern Pacific donated the engine to Inyo County. A group of volunteers built the short run of track in Dehy Park. The locomotive arrived on the back of a truck. As an appreciative crowd watched, the engine was placed on the track. It remained a well-known landmark and anchor of Dehy Park for the next 62 years. Before it was retired to the park, the Slim Princess had quite a work history. 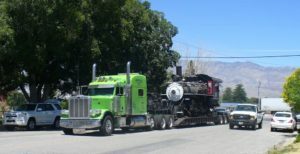 The narrow-gauge engine, which was built in 1911, came to the Owens Valley in 1928 and was operated by Southern Pacific, which had taken over the original Carson & Colorado route from Keeler to Nevada. In later years, the route was shortened to just Keeler to Laws. The steam locomotive was replaced by a diesel electric engine in 1955. 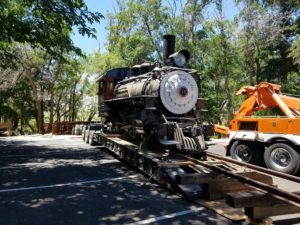 The move to the museum grounds represents one of the final steps in the successful effort to restore the engine to fully operating condition. 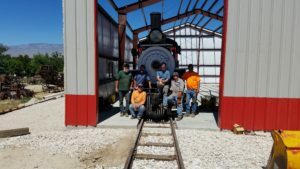 The non-profit Carson and Colorado group has spent the last five years working to get the locomotive running. After firing it up late last year, the group obtained all the relevant state and federal permits to operate the engine. Volunteers, including numerous professional steam engine and locomotive mechanics and engineers, put in thousands of hours of work on the engine. 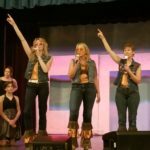 Financial help came from some grants and large donations, but mostly came from selling t-shirts and hats and hundreds of small donations and fundraisers. 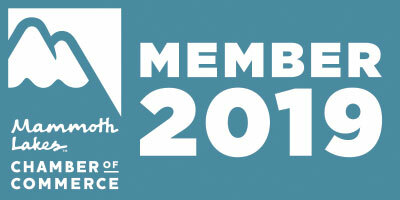 Over the years, more than $100,000 was raised to fuel the restoration effort. Another group of large donations from the Friends of the Eastern California Museum, Carson and Colorado, and the Museum/Inyo County funded construction of the Larry Peckam Engine House on the grounds of the Eastern California Museum. 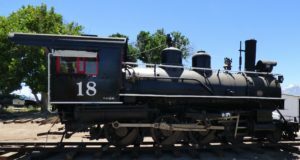 The locomotive will get an official dedication on Monday July 3, during the Slim Princess Engine #18 Silver Spike Celebration. The locomotive will steamed up around noon, and the final “spike” will be ceremoniously driven on the 300-foot length of track on the museum grounds. Visitors will be able to take an up close look at the locomotive and talk to the engineers and mechanics who rebuilt her. 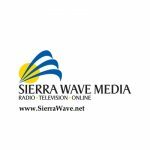 The Idle Hands Bluegrass Band will perform starting at about 4 p.m., and there will be a fundraising tri-tip dinner on the museum grounds, at 155 N. Grant Street in Independence. Please RSVP for the dinner by calling 760-878-0258, or going online at https://tinyurl.com/ku9nkm3. 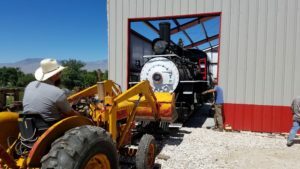 I thought the end result of this restoration was that the train would be returned to service as a tourist deal and put on a loop-track & would carry passengers, just like the one at Virginia City, Nevada . Seems like a huge waste to get the steam engine back in working order, and not work it . Kinda like restoring a ’65 Mustang , and letting it sit in a garage. Why would anyone vote negatively on something so positive ? I’m sure it was either HERE, or the Inyo Register that I read that the train would see service again . Haters gonna hate ,I guess. I doubt if anyone voted negatively about the beautiful restoration of a piece local history. What amazes me is so many people voted for your crass, insensitive and asinine comment that it was all a waste because YOU can’t go for ride. A 65 Mustang has millions of miles of road, waiting at the end of the driveway, to be explored. A steam engine needs tracks to move on. 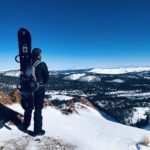 Tracks that no longer exist in the Owens Valley. Next time you have a million dollars in your pocket please drop it off at ESM. 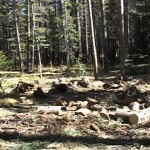 That might pay for a mile or two of survey, purchase, and construction of a short loop. I would prefer some tracks that actually went someplace, but that would be millions more. I personally would like thank all the people who donated the thousands of hours of the most precious commodity someone can give, their own time, and let them know that it was not time wasted. And also thank everyone who donated the $100,000 and tell them it was not money wasted. I hope I live long enough to hear the wail of #18s whistle once again in the valley. 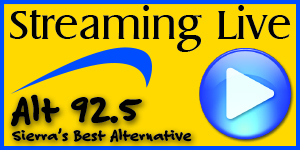 I was saddened to read Donald Salac’s somewhat vitriolic response to Rick O’Brien’s comment. I am from the UK where volunteers have donated their time to not only restoring hundreds of locomotives and rolling stock to working order but their track to run on as well, Indeed they have even invested time and money in creating new build versions of locomotives that had been scrapped. Whilst there were in the past a few cosmetic restorations that is not the fashion today, They are built/restored to steam again. Now there may be some good reason why it will not be possible for the Slim Princess to actually run again in the Valley. If so far better that be explained than respond with sneering remarks about Mr O’Brien wanting to go for a ride. For the record I have long been interested in this former SP line and was the delighted owner of a copy of Mallory Hope Ferrell’s excellent book within months of it’s publication in 1982. Now that I reside in California I was hoping to pay Engine 18 a visit, but am somewhat put off if Mr Salac is representative of the team involved in it’s restoration. As the majority of responses seem to support his remarks, sadly it would appear that my support will not be welcome.